(Newser) – The theory that King Tut's tomb also holds the remains of his stepmother, the legendary Queen Nefertiti, has tantalized Egyptian archaeology for nearly three years. 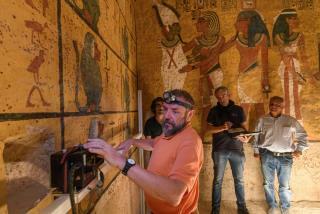 But after two scans with ground-penetrating radar proved inconclusive, National Geographic reports that third major scan is underway at the tomb in Luxor's Valley of the Kings, and it has exclusive photos of the operation. The scan will search the walls of Tut's tomb for signs of a hidden chamber and is expected to take about a week, reports CBS News. Several weeks of analysis will then follow. Egyptologist Nicholas Reeves believed he saw telltale signs—traces of sealed entrances in the north and west walls of Tut's tomb—in a 2015 scan. They have people creating fake items right now. Soon they will tell the world they found so many priceless treasures. These researchers seem willing to spend a lot of time and money on this chamber. I wonder how much they'd be willing to pay me, if I show up with a couple of dowsing rods to "scan" the room.